This relief represents Demeter, maternal Goddess of the Earth, and especially of cultivated land. One of her attributes is wheat, shown here on her head. The name Demeter means Earth Goddess (De=Earth, Meter=Goddess) The adventures of Demeter and her daughter Persephone constitute the central myth of The Eleusinian Mysteries, the most important mysteries of classic Greece. Her symbols are the ears of wheat and a torch. 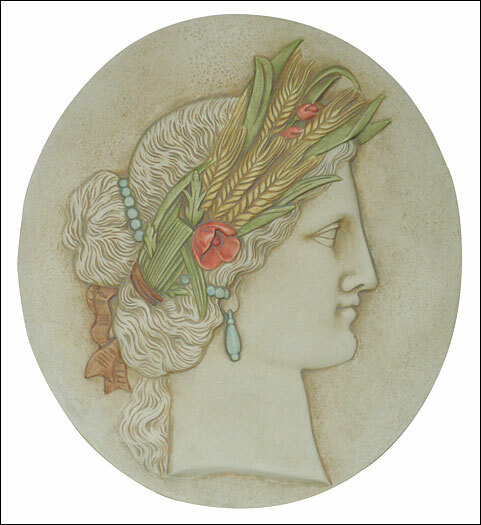 The ears of wheat are the sacred fruit of the Goddess of Farming and Cereals, and the torch alludes to the rituals of the Eleusinian Mysteries which took place at night by torch light. Demeter is credited with teaching humans how to cultivate crops, a task that she assigned to Triptolemus.